Despite being moderately obscure, intentionally underpowered, sidekicks, that were created to appease the growing “all cartoons need an educational/moral message” crowd that would ultimately be the death of the Saturday morning cartoon. 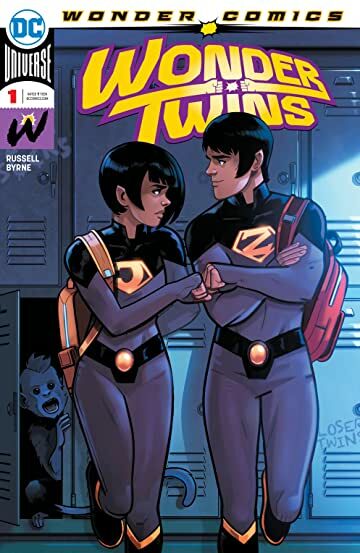 The Wonder Twins somehow have managed to nostalgically stay along the peripheral of pop culture for over 40 years now. Well, they are back in an all new series. I’m not entirely sure what continuity this book takes place in, and I’m not entirely sure I care. Mark Russel’s story and dialogue both have a distinctly Superfriends feel to it, with the more established heroes taking on a more lighthearted tone than currently normal. Even Batman comes across as downright personable. Issue #1 is a fun little introductory romp. We get a look around the twins’ new high school, Superman gives the Justice League some of their backstory, and Mr. Mxyzptlk gives the Justice League some trouble before inevitably encountering our young protagonists. Nothing deep. Nothing brooding. Just good clean fun. The comedy of Mark Russel is spot on, and the art by Stephen Byrne does a perfect job riding the line between 1980s wholesome and 2019 modern. Regardless of where in the multiverse this fits, it may be one of the funnest titles I’ve read from DC in a long time. I’m giving this a solid 4 out of 5 stars.